Taco night is one of those things that I can’t give up, no matter how healthy I eat. Even though I grew up in the midwest, far from lands where abundant avocados and recognizable cuts of beef graced the table for Mexican dinners, taco night was a much-loved staple. It made everyone happy. My guess is that Mom, despite having to dirty eight serving dishes with ingredients (hate that), was thrilled to spend more of dinner with us at the table than as a short order cook for whoever decided to be a picky eater that night. We all got to pick and choose our toppings and have our own perfect, customized dinner. The “build-your-own” dinner–pizza, nachos, burgers–excites kids, maybe because it involved us in the cooking process, making us little chefs for the night. Now that I’m the “executive chef” at our house, taco night (rarely an actual Tuesday), is still fun, for that same interactive factor. Okay, and the margaritas may have a tiny impact. My solution to the 8-serving-dish problem. Planning Mexican dinners does get increasingly difficult and boring when I try to keep meat and gluten out of the picture. Gluten isn’t too tough–yes, flour tortillas are delicious, but corn tortillas are more authentic and, I’ve discovered, just as soft and pliable when I take the time to make them myself. I don’t do it every time (like in these enchiladas–store bought organic corn all the way), so please don’t immediately quit reading because I’m out of my mind and there’s no way you’d ever have the time or desire to press two dozen corn tortillas with a Pyrex pie plate. 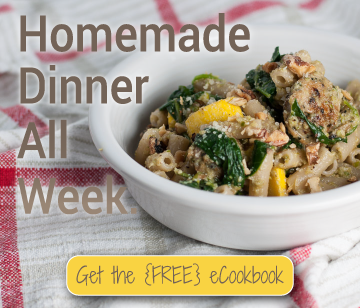 Meat, on the other hand–I can only handle so many black beans before swearing them off for two months, a threat I would never make toward the love-of-my-life legume, French green lentils. 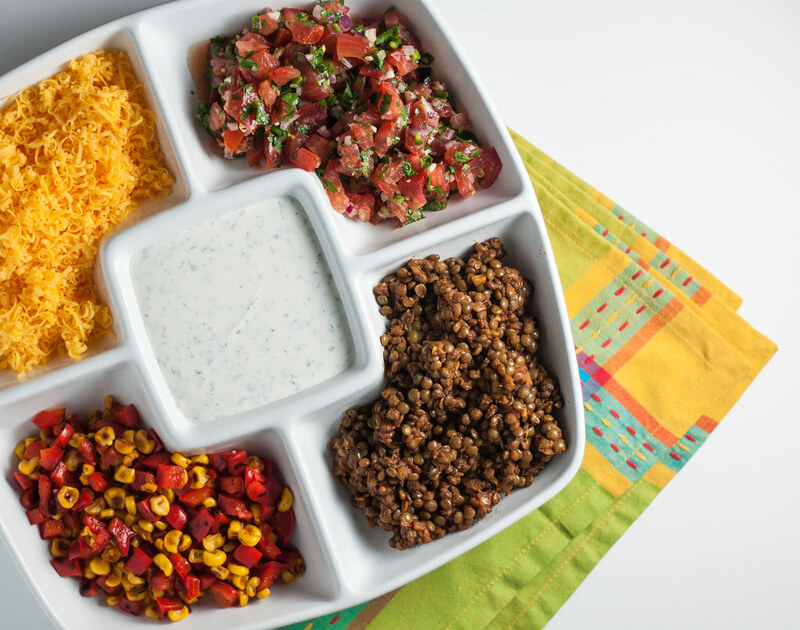 One layer in a taco dip: process taco spiced lentils in a food processor until smooth. You’ll likely need to add a bit of water and/or lime juice to achieve a smooth enough consistency. You could also whip in some sour cream for extra richness. Or microwave leftovers with a little shredded cheddar and a squeeze of lime juice, which has made a cozy, healthy lunch for me the last couple days as I eat through leftovers. They’re just as good hot, cold, or anywhere in between (since they’re meatless, you can bring them up to room temperature without food safety issues). I haven’t tried freezing them because, ummm, I ate them all, but they should do well in the freezer. Let me know how you serve them up! I find that “loose” lentils are not a good candidate for tacos, because they roll all over the place (much like ground beef tends to), including right out of the taco shell. If you want to do tacos, try this for added thickness: Make the lentils recipe through the last step, then mash the whole mixture up slightly with a big wooden spoon, a potato masher, or a few pulses in the processor. You’ll get a consistency more like refried beans, with whole lentils still discernible, that will stay put much better when wrapped in a taco shell. ONE POT update! No need to break out a second pan (the skillet) unless you really want to. I tested the recipe boiling the lentils in a 4 quart pot, and then wiping it out and making the recipe in it. They turned out great! 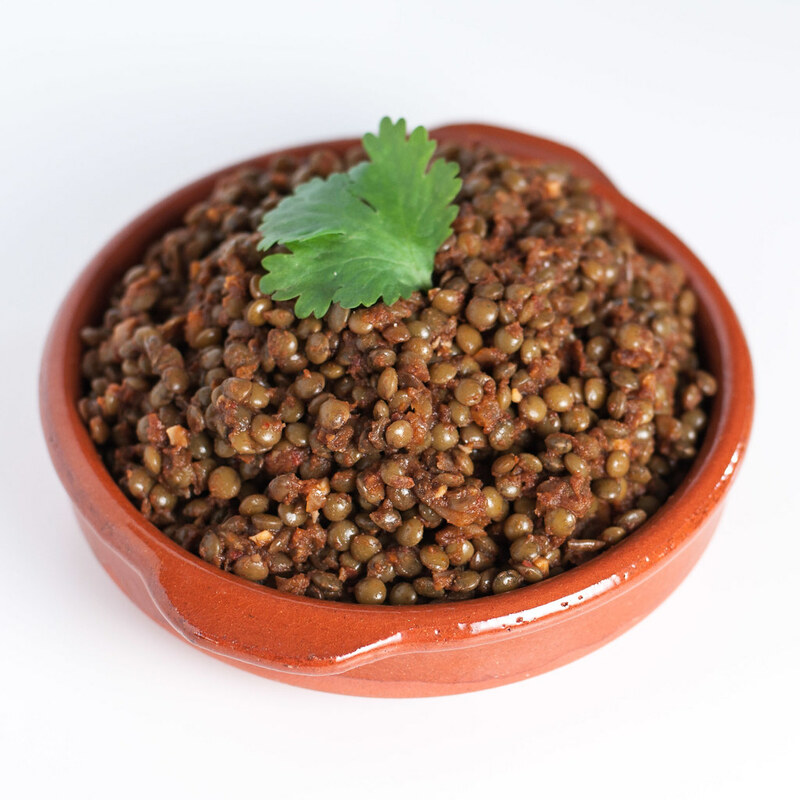 LENTIL TYPES: I tested the recipe using your typical green supermarket lentils (such as Goya). Still delicious, they just broke down a little more. 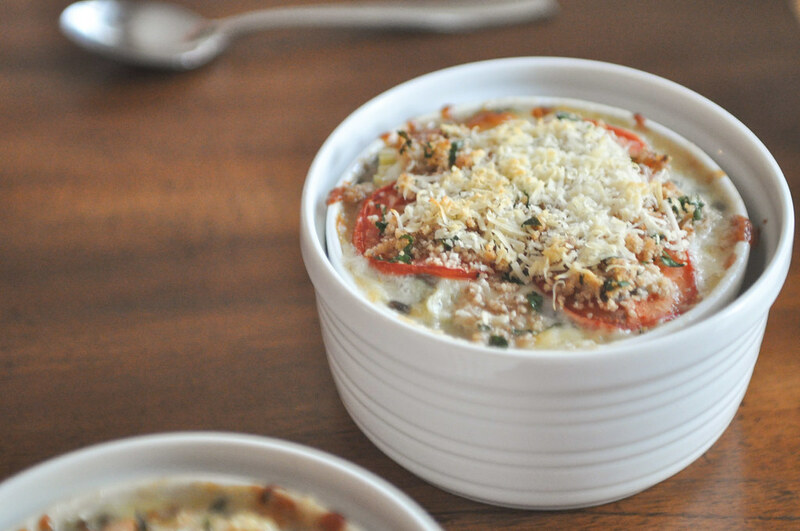 If you can’t find French green lentils, don’t worry! 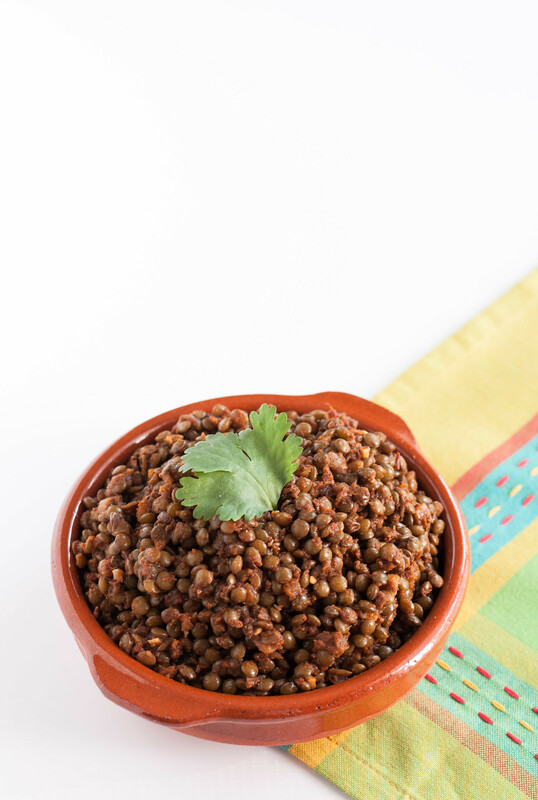 You could also skip boiling the lentils and use about 3 1/2 cups canned or refrigerated pre-cooked lentils. 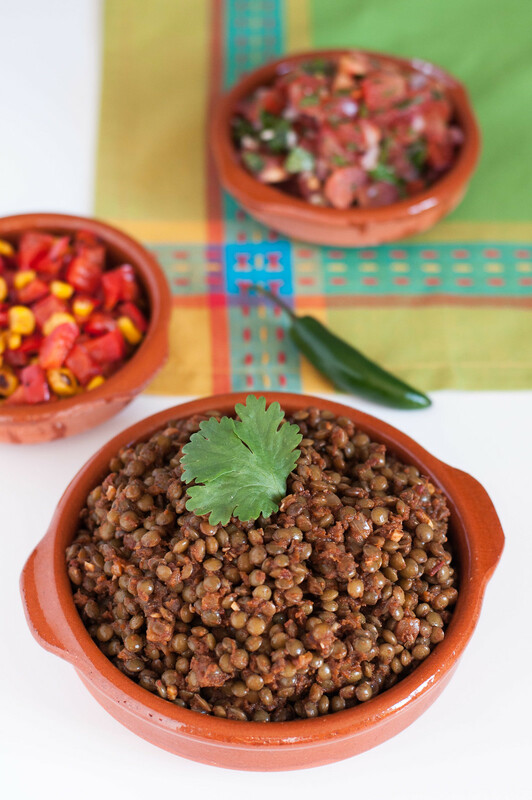 Mexican seasoned lentils help make any taco Tuesday (or meatless Monday) satisfying and spicy. 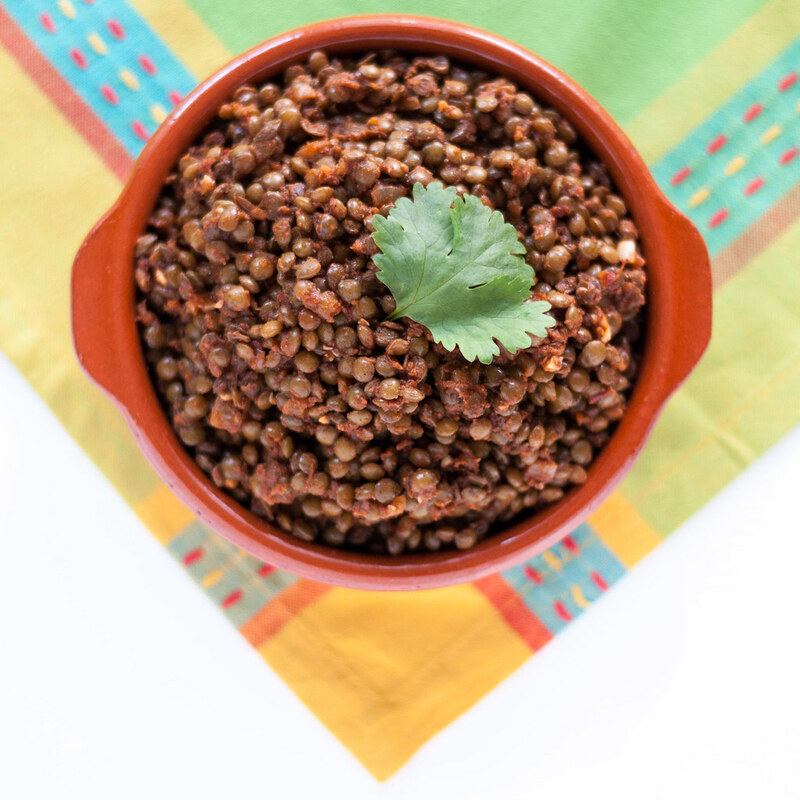 Besides tacos, use the lentils to mix up your enchilada, nacho, or quesadilla routine. Combine lentils, 4 cups water, and ½ teaspoon salt in a medium saucepan. Bring to a boil, stir, and reduce heat to a simmer. Cook for 20 minutes, uncovered, stirring occasionally, until lentils are tender but not falling apart (it’s more difficult to overcook French green lentils than other varieties, so the timing is forgiving). Drain and rinse. In a large skillet, heat oil over medium high. Add onions and cook about 5 minutes, until softened and starting to brown. Reduce heat to medium low, then add garlic, tomato paste, spices, and chipotle peppers. Stir constantly for 2 minutes, until spices are very fragrant. 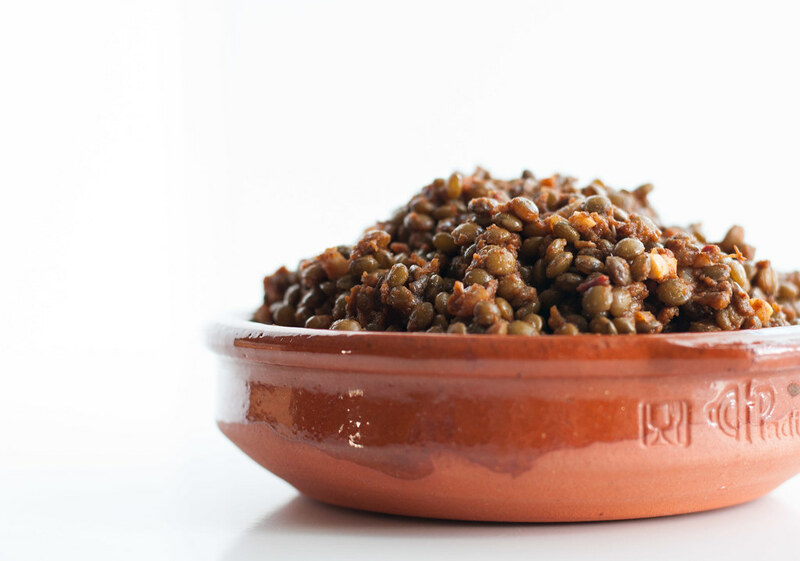 Pour in 1 ½ C water, scraping browned spices from bottom of pan, then add cooked lentils. Increase heat to medium high and use a wooden spoon to break up remaining chunks of tomato paste. Bring to a rapid simmer, then reduce heat and continue to simmer 20 minutes, until almost all liquid is evaporated. Remove from heat and let stand for 5 minutes. Stir in juice of one lime, then taste and season with salt as needed (about 1 teaspoon). Serve warm over taco salads, in tacos or enchiladas, or alone with some sour cream. Will keep about a week in the refrigerator. Make these well in advance if you like. They keep in the refrigerator for a few days.